Beneath the ocean’s floor, a dangerous secret sleeps. It’s another lost day for Sara Long aboard the deep-sea survey vessel, the Lewis. Technically, she’s running an experimental sonar that’s supposed to unlock the geologic secrets of the Mariana Trench, the deepest place on Earth. But really, she’s just running as far from home as possible. While checking a routine scan, an impossible image emerges of a city-sized object buried deep in the sediment. Sarah isn’t much of a geologist, but she instantly knows two things: One, this object, whatever it is, isn’t from this planet. And, two, she wants inside. Badly. Exploring this thing would be exactly what her rudderless life needs, if only the object didn’t have its own ideas. Sarah’s scan didn’t merely discover the thing. It woke it, along with the twenty-two thousand people inside it. And when they learn their own discovery, that their mission to seed the first human life on Earth has gone horribly wrong, they are not happy. Now Sarah’s running in whole new directions. And the world is running head long into a war it can’t possibly win. 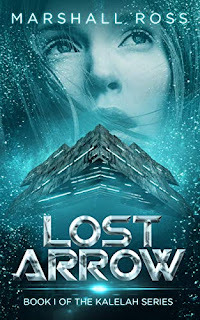 Moving between characters anchored in contemporary American life and those aboard a fascinatingly imagined starship, Lost Arrow is a fast-paced, speculative thriller that rethinks the line between alien and human by finding the cleverest of ways to erase it. If you love Michael Crichton and Dan Brown, start this heart-pounding series.